Before discussing how web servers work, it is first necessary to understand what a server is and how it affects the way your website or blog works. Fundamentally, a web server passes the information and data needed for you to run your website or blog onto your terminal, whether that is a PC, a Mac or a portable device such as a cell phone or tablet. Let’s begin by stating that this is not a technical post explaining how the Hypertext Transfer Protocol works with regard to HTTP requests and responses, nor about the technicalities of Java or C++ sockets. It is intended to explain in understandable terms what a server is and what part it plays in making your website or blog visible on the screen. For the vast majority, their server equates with their web hosting service. Fundamentally, a server provides a service. 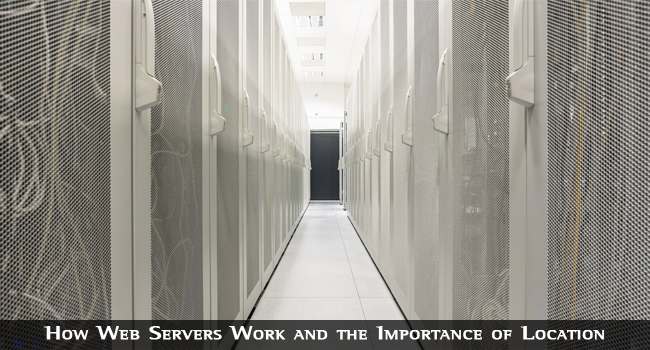 In internet terms there is more than one type of server. It can be a computer, a hard disk or even a piece of software. Here, we are discussing the web servers that help to run your website or blog, and how that works to provide you or your site with the files and graphics that make up your website or blog so that it appears to your visitors as you want it to. Such servers are generally banks of hard disks that are loaded with the software needed to run the server system, to run your website or blog and also for storage of the files and databases that must be loaded up when visitors click to visit your site. When you sign up for a specific web hosting service, you are fundamentally paying the host to provide you with server space, otherwise known as web space. In addition to that space, your web host will also provide bandwidth to enable transfer of files to and from the server and many other services, such as security, an operating platform known as a control panel (e.g. cPanel) and other services. All of this is provided from the host’s web servers. Shared hosting involves you being provided with part of a server – you are sharing server space with many other users. You do not actually get your own part of the server, but are given what is available at the time you need to use it. Most good web hosting services have plenty room on their servers for shared hosting, but if the space is over-sold you can experience downtime. Web hosting services such as HostGator, Bluehost and DreamHost offer plenty server space for shared hosting customers. Others may not, so check the guaranteed uptime offered. There are other more expensive services that provide you with a guaranteed amount of server space, known as VPS, or virtual private server hosting, and others than provide you with a server all to yourself. However, no matter what hosting service you have, your web server works in fundamentally the same way. The easiest way to explain how web servers work is to consider a commercial intranet, where company employees work from terminals with no storage capacity: no hard disk or DVD storage. All the software that runs their applications is stored on the company server as are the files that are generated in the course of their work. This server can be located in a room in the branch of the company, or be located in central office IT department in another city, country or even continent. It doesn’t matter where it is stored. Each individual employee can access the software and the files they need to use from a terminal without any storage capacity whatsoever. No USB slots, no DVD and no hard disk. The server provides access to the software and the files required that are stored on RAM while in use. Once you click ‘Save’ the changes to the file are stored on the server, and each individual in the company will have their own logins and individual permissions for access to specific types of file. Rather than having individual PCs, each has his or her individual or shared space on the company servers. Your laptop, PC or even your cell phone can be equated to the terminal in the above example. You web host server is the server, and all the software needed to operate your website is also stored on your web host’s server, along with your web pages, images and all the other files you use on your site. Let’s take WordPress as an example. If you have a WordPress blog, you will know that your media is stored on the server that is related to your site. When a reader clicks to access your blog, the link leads their request to your web host’s server system. That then initiates a sequence of events resulting in the components of your blog page being retrieved from the file system on the server, and then resolved on the visitor’s screen as your blog. When a visitor to your site clicks on a link, that click is seen as a request for the web page defined in the link URL to be accessed from the server storing that website’s files. Whether stored on your own web host’s servers or on another hosting service, the Uniform Resource Locator identifies the source of the link and then brings it to your screen. This is done according to the HTML and CSS coding of the site, and many different files are usually opened before all the information is retrieved to enable your linked page to be resolved on the visitors screen. These include the HTML source code for each page or blog, the headers and footers that are applied to each page, the various CSS formatting files, the images and all the other individual components that make up a web page. These are all stored on a server, not on your computer. To clarify this, the WordPress blogging software is not stored locally on your computer, but on your web hosting service’s server. Also stored on the web host servers is the software needed to operate the server, such as Apache, Linux, etc. although that is not stored on your web space. What is Stored Where – My Computer and the Server? What is stored in your portion of server is the software needed to run your website and content management system – that means WordPress for the vast majority of people. If you want to use Microsoft Office, you must download that onto your own computer yourself. That is because you use this software on your computer without needing access to the internet. The same applies to any other applications you need. Your server is loaded only with the software systems required to run your website or blog, and to make your files visible to those who click on your website or blog URL. In fact, your entire blog is held on your web host’s servers, including comments and your blog security system. It is a small area of space available for you to store everything that is involved your communications through the internet. Your server will provide the posts, pages, graphics and videos you want to be displayed when somebody visits your blog pages. It also provides space for you to store your blogging software (e.g. WordPress), databases and all other files require to run your blog. Check out anywhere on your computer and you will not find any of these files on your hard disk. They are all stored on the server. The speed with which your blog or website loads is largely dependent on the location of these web servers. Think about travel. It takes longer for you fly from New York to the UK than to Detroit. In the same way, the location of your server makes a difference to the speed of loading of your website or blog. We are not talking in hours here, of course, but in seconds – or even microseconds. If you are located in the UK and your server is located in New York, the guy in Detroit will likely get his blog loaded a lot faster than yours. Same with Australia: a server located in Melbourne will load a blog for a woman in Sidney much faster than for a guy in Mumbai. The importance of web server location cannot be overemphasized! The speed of loading of a site is one of the factors Google considers in it ranking calculations. If everything else is equal between two web URLs, the faster-loading site will likely be ranked the higher. If a visitor finds they have to wait for your blog to load, they may decide to try another site that resolves quicker. This is connected to the relative distances between server and the visitor. The proximity of your computer to the server is irrelevant. As you can see, even if the distance of your server from your computer is the same, the bandwidth makes a significant difference to the speed of transmission of your files. You can get more file size into a broadband service of greater bandwidth. If you look on broadband as being a pipe carrying your files, the greater the diameter of the pipe, then the faster your files will travel because more can be transferred at the same time. The amount of bandwidth that your web host’s servers can offer you is therefore of significant importance. a) Choose a web hosting service as close to your home town as possible. However, you would be restricting yourself in the choice available to you. The best hosting service for your needs may be located thousands of miles away. b) Check up if your host has servers located closer to home that they use for your location. For example, some American web hosting services maintain servers in Europe and Asia for their clients living in those continents. c) If you are using a blogging service such as WordPress, use a plugin such as W3 Total Cache. This can speed up server speed and WordPress download times by caching the files used most often. d) Use a CDN system. Content Distribution Networks can speed up the loading of your site by storing static content on a number of servers in a worldwide network of servers. Your computer would be supplied with the static content for your website or blog from the server nearest to you, based upon your IP address. It is very important that your blog or website loads quickly. Not only will slow loading result in a higher bounce rate, as people get tired waiting, but it is also a factor included in Google’s ranking algorithm. Not only does slow loading affect your potential traffic volume, but you are also less likely to keep them once they do see the link to your site. The importance of location of your web servers is very important since it plays a big part in how fast your web pages and blog posts resolve once potential visitors click on your link. It’s like waiting for a bus and two come along at once. The slow one and the fast one – which would you choose?